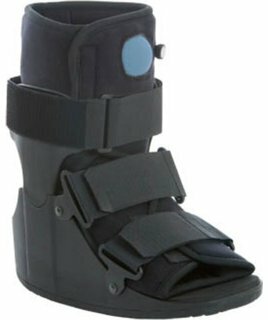 CAM Walker | Walking Boot A CAM Walker or walking boot can be used in place of a traditional hard cast for fractures, plantar fasciitis, Achilles tendonitis and more. It is light weight and removable. Cam Walkers are a controlled ankle motion boot, the Cam walker boot are for patients who have injured their ankle (it can be either a sprain or a fracture) and also by those who have suffered from a fracture in their foot. It is typically recommended for patients suffering from tendonitis, ligament tear and soft tissue injuries of the foot. These boots control the movement of the foot during the rehabilitation process. Unlike a standard cast, the user can remove these boots while taking a shower or while allowing medicine. Apart from that, the design of these boots permits the patient to walk without the help of crutches. Since cam walker boots utilize Velcro closures, they can accommodate changes in the injured foot such as swelling, which is not possible with the traditional casts. Since the heel of a CAM boot is thicker than that of a normal boot, the user should wear a boot of matching heel height on the other foot. This will prevent them from developing back and hip pain. While CAM walkers do not provide the same degree of immobility that an orthopedic cast offers, they have some advantages. Unlike casts, they are adjustable and reusable, and fully removable, permitting the patient to bathe the foot and ankle and remove the walker at night, if they so desire; and a CAM walker requires no special modifications for the patient to bear weight and walk. With some fractures, however, removal may result in worse outcomes and thus this may be a negative; also, with some fractures, the person should be non-weight bearing.